Our Epistle today, Ephesians 4:7-13, quoting from Psalm 68:18, mentions Christ ascending and descending. He ascended to God’s throne above the heavens after His resurrection, and also descended into Hades upon His death on the cross. This Ephesians reading for the Sunday after Theophany is tying together for us several ideas that the Church wishes to emphasize in its proclamation of the Good News. Of course there is that cosmic picture of Christ who is God the Word descending to earth to be born in a cave and laid in an animal manger – an event we celebrate as the Nativity of Christ. But Christ continued His descent, dying on the cross, being buried and descending into Hades to free all the dead from imprisonment and slavery to Satan. Christ ascended from Hades to appear on earth to show us all His resurrection. He then continued His ascent all the way to the throne of God’s Kingdom above the heavens. 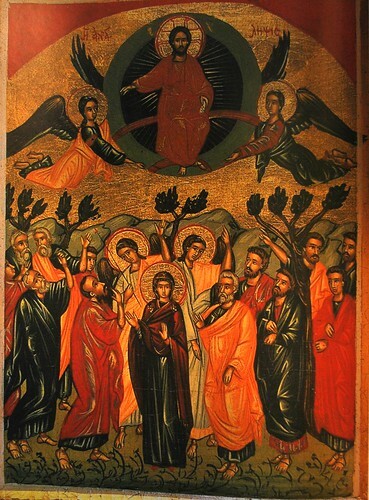 And this cosmic picture of Christ ascending from Hades to the height of heaven which is also our salvation is foreshadowed in the events of Christ’s descending at his baptism down into the Jordan River and then ascending out of the River to be proclaimed God’s own son. Baptism as we all should know is exactly an image of being buried beneath the waters and then raised from the dead to new life. Christ foreshadows his death and resurrection with His dying and rising at his baptism in the River Jordan. Additionally, at the baptism of Christ, the feast we call Theophany, the Holy Trinity is revealed to us as well as to the entire world. This is the great Light which has dawned for us that is mentioned today’s Gospel lesson. 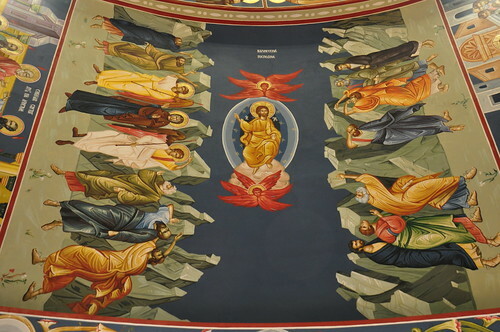 The connection between Theophany and Christ’s descent into Hades was made at one point in Orthodox history when numerous Orthodox churches took to painting on the back (west) wall of the Church, two icon frescos, one on top of the other. The upper panel/fresco had the Baptism of Christ from Theophany in which the Trinity is revealed to us. 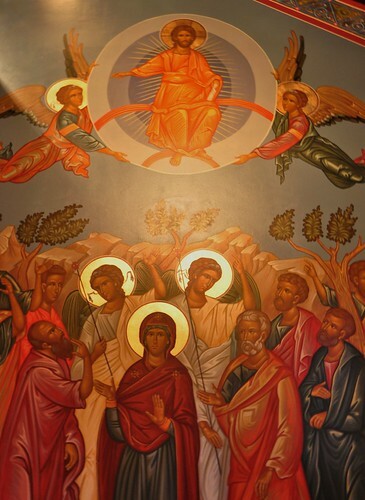 Beneath that icon was the icon of Christ’s Descent into Hades with those saved souls looking up to the icon of the Baptism of Christ. They understood the Baptism of Christ was the prefiguring of His descent into Hades. In those churches with the large fresco icons one on top of the other, the door to the church was located in Hades as well. 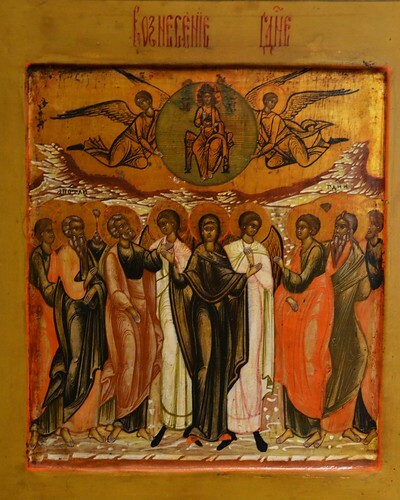 On Holy Saturday, the congregation in the church would watch as the newly baptized were brought into the church literally passing through their own death and sojourn to Hades where they were united to and saved by Christ. All of that is still remembered in our Church on Holy Friday when we enter the church after our procession and all pass beneath the winding sheet and we have the ideas that we are passing into the tomb of Christ as into Hades itself where we proclaim and celebrate the resurrection! The Epistle mentions Christ leading the captives out and bestowing on them gifts. We understand this as our being led out of imprisonment in Hades, slaves to death. The gifts given to us are those Christ bestows on His church as mentioned in today’s epistle. – You (plural) are God’s temple. You (people) have God’s Spirit living in us. The Church is not a building, but the people of God. The Church is you and I doing God’s will on earth. 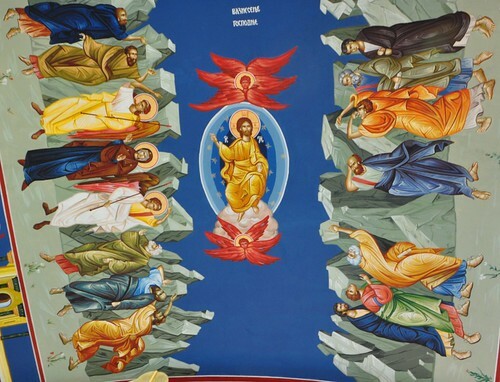 When people come and see the Orthodox Church, they might come and look at the beautiful, interesting and ancient icons on the walls of the building, but they should come to see the living temple, the living icons – namely you! It is not the building that makes us Orthodox. It is not the building that makes the Orthodox Church. It is you people, the parishioners, the members of this parish! How we love one another. How we are like Christ. Do you not know that you are God’s temple and that God’s Spirit dwells in you? . . . For God’s temple is holy, and that temple you are. God entrusts us to make His Holiness present on earth and available to all who wish to enter into Communion with Him. God wants us to be witnesses to the Light, but also to be that Light to the world. In this way we live in God. We remove our life from this visible world to that world which is not seen by exchanging, not the place, but the very life itself and its mode. 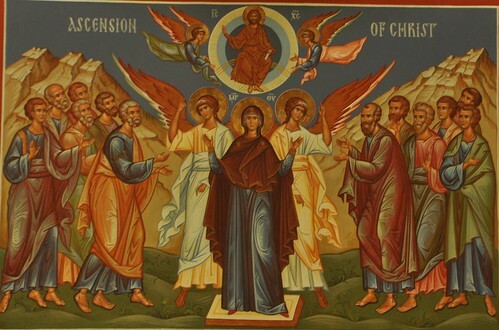 It was not we ourselves who were moved towards God, nor did we ascend to him; but it was He who came and descended to us. It was not we who sought, but we were the object of His seeking. 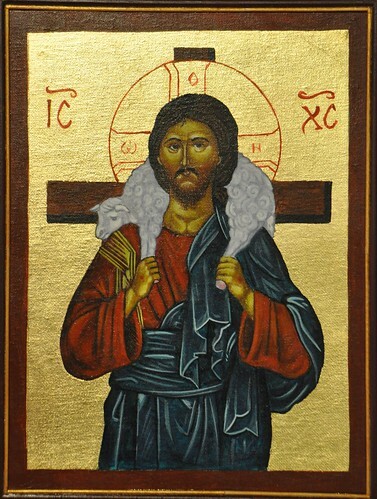 The sheep did not seek for the shepherd, nor did the lost coin search for the master of the house; He it was who came to the earth and retrieved His own image, and He came to the place where the sheep was straying and lifted it up and stopped it from straying. He did not remove us from here but He made us heavenly while yet remaining on earth and imparted to us the heavenly life without leading us up to heaven, but by bending heaven to us and bringing it down. As the prophet says, “He bowed the heavens also, and came down” (Ps. 18:10). The exalted Jesus participates in God’s unique sovereignty over all things. At a very early stage, which is presupposed and reflected in all the New Testament writings, early Christians understood Jesus to have been exalted after his death to the throne of God in the highest heaven. There, seated with God on God’s throne, Jesus exercises or participates in God’s unique sovereignty over the whole cosmos. This decisive step of understanding a human being to be participating now in the unique divine sovereignty over the cosmos was unprecedented. The principal angels and exalted patriarchs of Second Temple. Jewish literature provide no precedent. It is this radical novelty which leads to all the other exalted christological claims of the New Testament texts. But, although a novelty, its meaning depends upon the Jewish monotheistic conceptual context in which the early Christians believed it. Because the unique sovereignty of God over all things was precisely one of the two major features which characterized the unique identity of God in distinction from all other reality, this confession of Jesus reigning on the divine throne was precisely a recognition of his inclusion in the unique divine identity, himself decisively distinguished, as God himself is, from any exalted heavenly servant of God. 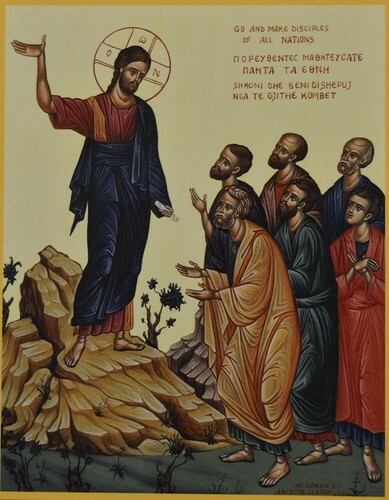 “After His resurrection from the dead Jesus appeared to men for a period of forty days after which He “was taken up into heaven, and sat down at the right hand of God” (Mk 16.19; see also Lk 24.50 and Acts 1.9–11). 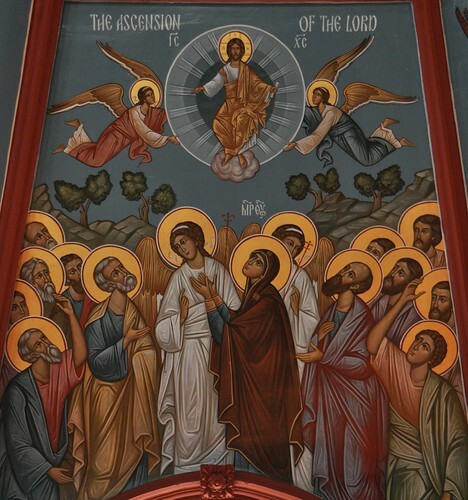 The ascension of Jesus Christ is the final act of His earthly mission of salvation. 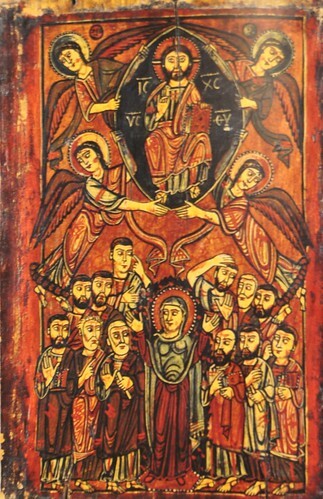 The Son of God comes “down from heaven” to do the work which the Father gives Him to do; and having accomplished all things, He returns to the Father bearing for all eternity the wounded and glorified humanity which He has assumed (see e.g. Jn 17). 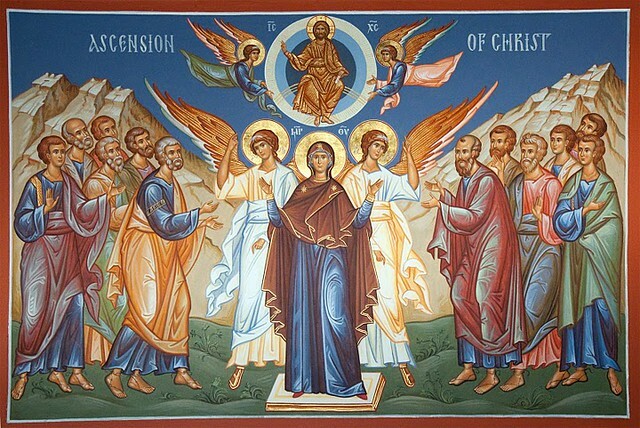 The doctrinal meaning of the ascension is the glorification of human nature, the reunion of man with God. It is indeed, the very penetration of man into the inexhaustible depths of divinity. We have seen already that “the heavens” is the symbolical expression in the Bible for the uncreated, immaterial, divine “realm of God” as one saint of the Church has called it. 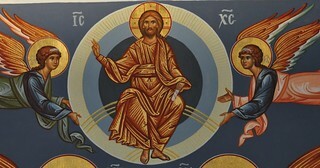 To say that Jesus is “exalted at the right hand of God” as Saint Peter preached in the first Christian sermon (Acts 2.33) means exactly this: that man has been restored to communion with God, to a union which is, according to Orthodox doctrine, far greater and more perfect than that given to man in his original creation (see Eph 1–2). 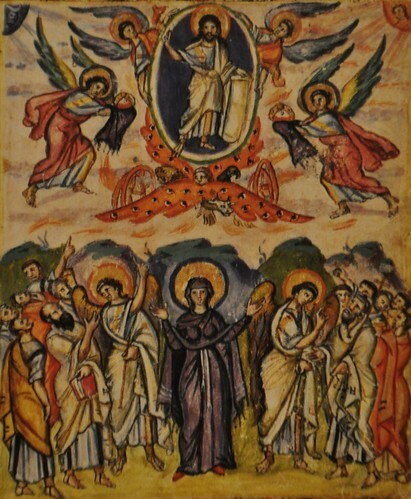 In one of the hymns from the Feast of the Ascension we catch sight of the theological importance of this Feast of the Lord in God’s plan for the salvation of humanity. Christ the incarnate God refashions human nature, lifting humanity up from the depths of sin, bringing human nature to the throne of God. After the humans sinned, they were driven from Paradise and returned to the earth from which they had been fashioned. Christ becomes incarnate on earth to restore humanity to God. O GOD, YOU HAVE REFASHIONED THE NATURE OF ADAM WHICH HAD FALLEN INTO THE DEPTHS OF THE EARTH. YOU HAVE LED IT UP TODAY ABOVE EVERY PRINCIPALITY AND POWER, FOR IN YOUR LOVE FOR IT, YOU HAVE SEATED IT TOGETHER WITH YOURSELF! SINCE YOU HAVE TAKEN COMPASSION ON IT YOU UNITED IT TO YOURSELF AND HAVING BEEN UNITED WITH IT, YOU SUFFERED WITH IT. AND A PASSIONLESS ONE, YOU SUFFERED PASSION TO GLORIFY IT WITH YOURSELF! Salvation is the restoration of humanity in our relationship with God. We experience a reunion with our Creator. 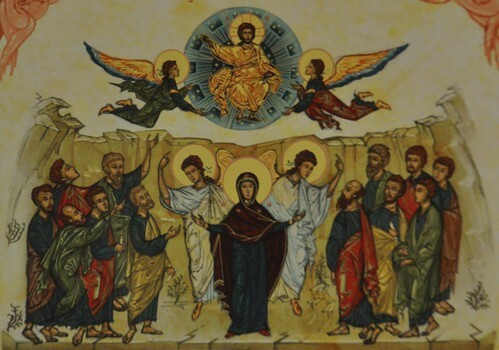 In the Ascension, however this event is to be understood historically and factually, God fully accepted human nature and reunited us humans to Himself in Christ. God suffers in the flesh to redeem human nature and to bring us back, body and spirit into God’s presence. God redeems human nature to save each of us – body and soul. A joyous and peace-filled Ascension Day to all! The former account I made, O Theophilus, of all that Jesus began both to do and teach, until the day in which He was taken up, after He through the Holy Spirit had given commandments to the apostles whom He had chosen, to whom He also presented Himself alive after His suffering by many infallible proofs, being seen by them during forty days and speaking of the things pertaining to the kingdom of God. And being assembled together with them, He commanded them not to depart from Jerusalem, but to wait for the Promise of the Father, “which,” He said, “you have heard from Me; for John truly baptized with water, but you shall be baptized with the Holy Spirit not many days from now. Therefore, when they had come together, they asked Him, saying, “Lord, will You at this time restore the kingdom to Israel?” And He said to them, “It is not for you to know times or seasons which the Father has put in His own authority. But you shall receive power when the Holy Spirit has come upon you; and you shall be witnesses to Me in Jerusalem, and in all Judea and Samaria, and to the end of the earth. Now when He had spoken these things, while they watched, He was taken up, and a cloud received Him out of their sight. And while they looked steadfastly toward heaven as He went up, behold, two men stood by them in white apparel, who also said, “Men of Galilee, why do you stand gazing up into heaven? This same Jesus, who was taken up from you into heaven, will so come in like manner as you saw Him go into heaven.” Then they returned to Jerusalem from the mount called Olivet, which is near Jerusalem, a Sabbath day’s journey. How the feast has been kept has changed over time, but its significance as an event in the salvation of the humankind has been recognized and honored by Christians through the centuries.